It seemed about time for another round of haiku (and if haiku isn’t really your thing, please go back one post and read Spring by Mary Oliver… its lovely). As with my day of haiku-ing in the Los Angeles airport, I don’t know if these are traditionally accurate. But they do follow that beloved 5-7-5 system. as you drift and sigh. 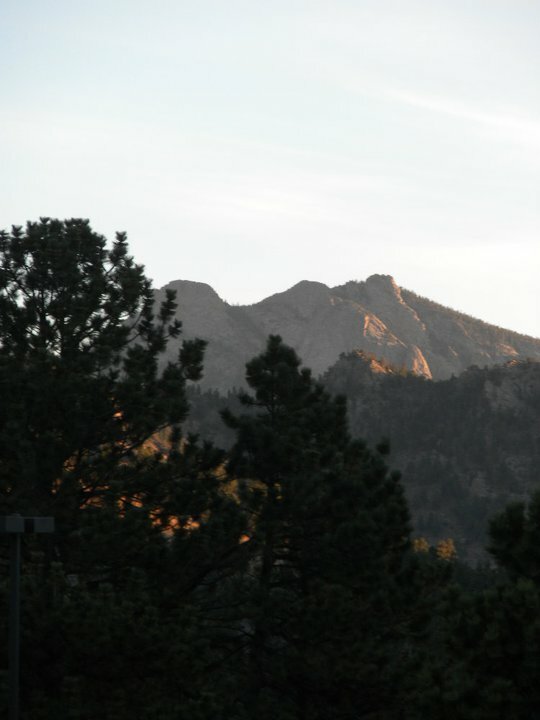 I’m a city girl by brain, but my heart lives in some kind of amalgamation of woods, fields, rivers and oceans. This afternoon, I stood on a street corner while cars screeched by and people laughed in coffee shops and I smelled it… nature! Spring! I know spring is still a ways away and I’ve already posted extensively on it here, here and here, but my heart is so ready for those little green buds. Towards the end of my graduate school career, I was well-prepared to create meaningful work, teach at the university level, articulate the vital connections between dance and societal growth, make the world a better place through art, and push the boundaries of collaboration between dance, technology, cultural studies, philosophy, science and a host of other fields. But I didn’t know how to make a living. Lois Welk, Director of Dance USA, came to my Producing Dance class during my final semester and gave the class some wonderful advice. I recently dug up my notes from her visit and think all artists (all humans, really) could benefit from her logic. 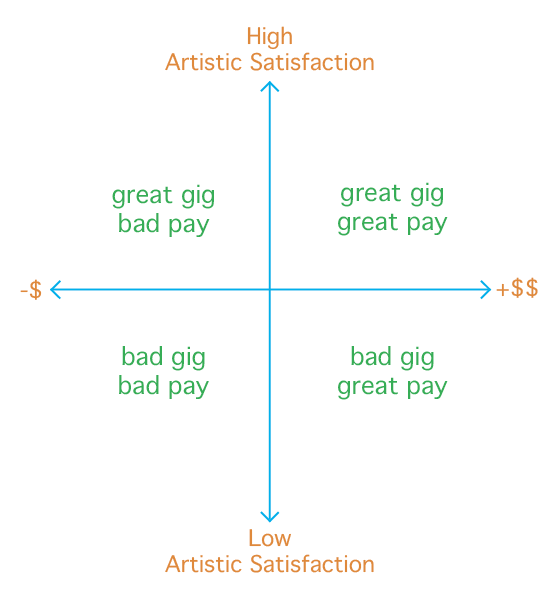 What became immediately apparent to my class of uber-smart dance academics is that we should not pursue opportunities that don’t whet our artistic appetites or pay for sandwiches (in graphic terms, we should stay away from the lower left quadrant). This should have been obvious before Lois came to visit, but most of us had been saying yes to everything. Every show, every choreography request, every plea for an extra stage hand—all in the name of serving the dance community and increasing our personal visibility. Lois addressed our misguided actions by reminding us that we continuously brand ourselves based on the decisions we make. Consistently agreeing to do mundane work for free would let the community know that we do mundane work for free (duh). Eventually, we’d all be flat broke and faced with more mundane, low-paying opportunities than we could handle. 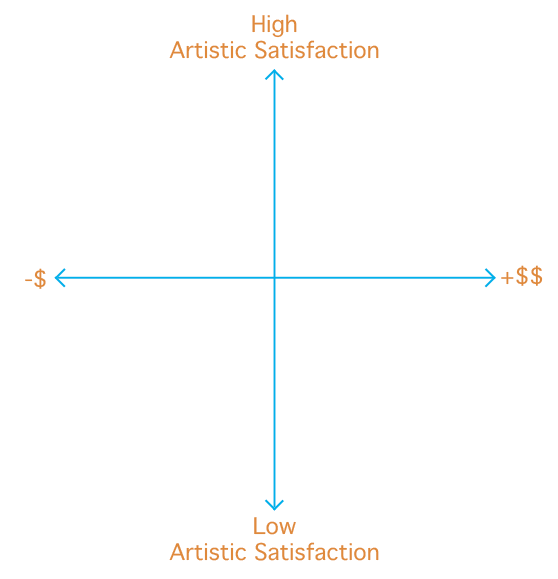 In terms of job and artistic growth, nothing else is worth pursuing.